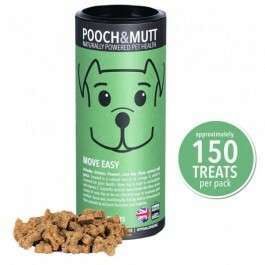 Pooch & Mutt Move Easy dog treats are natural, ethical, low-calorie, hand-baked mini-bones that dogs love. They include chicken, linseed, rose hip (Rosa canina) and yucca. Linseed is a natural source of omega 3, which is essential for joint health. Rose hip is high in antioxidants and vitamin C. Scientific studies have shown the Rosa canina variety of rose hip to be an effective way to maintain joint comfort. Yucca was traditionally fed by Native Americans to their animals to aid joint function and mobility. Ingredients:Oats, Rice, Rye, Chicken, Oils & Fats, Yeast Extract, Linseed, Rose Hip, Yucca, Rosemary Extract.